SDU The Journal of Health Science is an open access peer-reviewed scientific periodical covering the fields of nursing, environmental health, clinical and laboratory medicine. This journal is indexed or abstracted by: EBSCO, TR Journal Database, Turkey Foundation for Medical Education and Research. SDU The Journal of Health Sciences is published three times per year (April, September and December) in its printed edition. However, accepted papers are published online, as soon as the corrected proofs are available, prior to print publication. Disclaimer: Articles appearing in the published ahead-of-print section are posted at the "Post Author Correction" stage of production. A Post Author Correction article is a composed proof of a peer-reviewed article that has been substantively edited and copyedited, and it contains the author's and editorial office's proofreading corrections. However, these articles will be reviewed one additional time before print publication. Any final changes in the manuscript will be made at the time of print publication and will be reflected in the final electronic version of the issue. 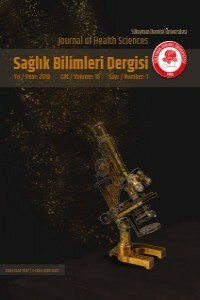 University of Suleyman Demirel, the editors and authors, and their respective employees are not responsible or liable for the use of any potentially inaccurate or misleading data, opinion, or information that may be contained within the articles found in the published ahead-of-print section of the SDU The Journal of Health Sciences Web site. Plagiarism and self-plagiarism are not allowed and they will be dealt with according to the COPE guidelines (http://publicationethics.org/resources/guidelines). This Journal uses a Crosscheck/iThenticate software for the detection of the text similarity and overlapping of the submitted manuscripts with published literature. Advertising is separate from content. Advertisers and sponsors have no advance knowledge of our editorial content, nor do the editors have advance knowledge of advertisers. Content is never altered, added, or deleted to accommodate advertising. Advertisers and sponsors have no input regarding any of our editorial decisions or advertising policies. The advertising sales representatives have neither control over, nor prior knowledge of, specific editorial content before it is published.SDU The Journal of Health Sciences reserves the right to decline or cancel any advertisement at any time. Advertising must be factual and in good taste in the judgment of the Publisher and Journal of Health Sciences management. Please note: Readers who click on an advertising banner or other advertising link may connect to a site different from Journal of Health Sciences to view additional information. Such sites may also ask visitors for additional data. Journal of Health Sciences does not participate in, nor control such sites. Third-party advertisements on SDU The Journal of Health Sciences web site may not include any SDU The Journal of Health Sciences or University of Suleyman Demirel Institute of Health Sciences publication name, logo, or title. Advertised products must be compliant with the regulations in the country where the advertisement will be seen. Users will be able to distinguish advertising and editorial content clearly on the web site.SDU The Journal of Health Sciences does not endorse any company, product, or service appearing in its advertising. Advertisers and sponsors have no control or influence over the results of searches a user may conduct on Journal of Health Sciences web site. Search results are based solely on the functionality available through our search software (e.g., keywords or natural language) and user-defined criteria. Updates to our Internet advertising policy will be posted to this web site. These types of advertisements are generally acceptable for consideration: research and laboratory reagents; medical/research equipment products and services; medical software; practice-management products and services (including office equipment and supplies, medical billing systems, medical software products) and medical web sites. SDU The Journal of Health Sciences applies the Creative Commons Attribution License (CCAL) to all works we publish (read the human-readable summary or the full license legal code). Under the CCAL, authors retain ownership of the copyright for their article, but authors allow anyone to download, reuse, reprint, modify, distribute, and/or copy articles in Journal of Health Sciences, so long as the original authors and source are cited. No permission is required from the authors or the publishers. In most cases, appropriate attribution can be provided by simply citing the original article (e.g., Julija Ogrin Papić, Borut Poljšak. Antioxidant potential of selected supplements in vitro and the problem of its extrapolation for in vivo. SDU The Journal of Health Sciences 2012;2(1):5-12). If the item you plan to reuse is not part of a published article (e.g., a featured issue image), then please indicate the originator of the work, and the volume, issue, and date of the journal in which the item appeared. For any reuse or redistribution of a work, you must also make clear the license terms under which the work was published. The Publisher does not charge for publiation of the articles in Journal of Health Sciences. SDÜ Sağlık Bilimleri Dergisi, makalenin gönderilmesi ve yayınlanması dahil olmak üzere hiçbir aşamada herhangi bir ücret talep etmemektedir. Dergimiz, bilimsel araştırmaları okuyucuya ücretsiz sunmanın bilginin küresel paylaşımını artıracağı ilkesini benimseyerek, içeriğine anında açık erişim sağlamaktadır.